Reviews | Regal Mediterranean Herb Blend - 16 oz. Add a Mediterranean flair to your recipes with the convenience of this Regal Mediterranean herb blend! It features a savory combination of salt, pepper, starch, garlic, MSG, oregano, sugar, onion, and parsley. Use it for fish and chicken that's grilled, baked, or fried. It's also a good base for a Greek house dressing when mixed with chopped black olives and crumbled Feta cheese! Great for traditional sauces and dishes like traditional mash potatoes. We wish it was available in a bigger size unless we didn't see it. Great with red wine. I tried this Mediterranean herb for the first time on chicken and oh my.. it tastes amazing! I would definitely be purchasing this again when I'm all out! This is a very nice blend of spices that will certainly not disappoint your customers and will be an especially nice compliment to poultry dishes. A very good herb blend. Very high quality, and this would be good for anything from pizza sauce, to pasta, to salads. The price can't be beat, either. Very nice amazing blend of seasoning. i used on grill chicken breast in my restaurant. Mix with little oil and rub it on bone or boneless. Love the Mediterranean herb blend and the nice flavor boost it gives our dishes. Great set of herbs in this blend and it smells fantastic. The regal Mediterranean herb blend is a great mixture of spices. Perfect for adding to our Greek pasta salad. Very fresh and rich tasting seasoning. I love the freshness of Regal's seasoning blends. They are well packaged and great quality. The Mediterranean herb blend is great for mixing with oil and dipping pita bread. I love this Mediterranean herb blend and it is perfect for seasoning meats or vegetables. I love using this an oil dip blend as well. We mix it with olive oil and dip bread. It is so delicious. This is a really nice blend. It tastes great whether using on chicken or meat, or using mixed in with cream cheese or yogurt for a dip/spread. I usually use these seasoning to brighten the flavors of my chicken fingers and crack chicken. It's a dish made in the Bahamas. It tastes really good. THIS IS SOMETHING NEW WE HAVE TRIES AND ITS REALLY A GREAT BLEND OF SEASONING. WISH THEY HAD IT IN BIGGER BOTTLES SO WE CAN ORDER MORE. Great Mixture of spices seems to work well on many dishes I enjoy putting it on pasta and chicken dishes the most, have tried it with vegetables a few times but the spice seemed to over power the natural flavor of the vegetable. Its an awesome spice!! I really enjoy cooking with this Mediterranean herb blend! Great quality and full flavor really uplift my meals! I would recommend this blend to any professional kitchen or even household! I blend mine with sour cream (you could also use greek yogurt for a healthier option). You can spread the mix over homemade gyros and it really takes the recipe up a notch! This is a great med herb blend. It has the pefect balance of flavor. We love to use it on poultry, lamb and even grilled or roasted vegetables. A good blend of spices. There are a number of spices in here that make it perfect for things like Mediterranean soup or similar dishes. We enjoy using this on grilled fish dishes. The herbs are very present but not overwhelming for the more simple fish like cod. Give it a try! Have a spice blend in the cabinet is always handy so you can ensure you get consistent flavor and you don't have to mess with several different spice bottles. This herb blend adds great flavor, especially on grilled chicken! We use this sparingly because we do not do many mediterranean dishes with the area that I am in. However the times that I have used it the flavor profile from this is amazing. This Mediterranean blend is perfect for chicken meals. I use it at least 2-3 times a month and it produces excellent results! It takes the guess work out of trying to do individual spices separately. Adds a fantastic flavor to roasted vegetables. Would purchase again Love the aroma and smell. Made to kitchen smell great; Every pantry should have this spice.. This is a good base for many different types of dishes, not only Mediterranean ones. It becomes more Mediterranean though when cumin and coriander are added. I enjoy a variety of flavors and options in my home kitchen and this is one that I put into use frequently. We love it. I thought this was great as a mediterrainian blend. It was a bit heavy on the greenery but it ended up making for a great grilling spice. We thought the grilled chicken worked perfectly for this. The price on this makes it easy to add an extra item to your menu. One of my favorites for sure. I personally love this one because it can give almost anything an middle eastern kick. One of our favorite things to do with this is go with chicken breast and vegetables straight into a saute pan and add this early on as it is just coming together. the flavors of this blend plus the sear of the hot saute pan come together for an awesome outcome sure to impress your guests. Regal s perfect for seasoning. I personally have use this for my meats and it always brought out a exotic flavor to my meals. Will Buy again. A disappointingly dull mixture with too much garlic and onion powder that is overpowering and overbearing. The mixture doesn't meet our criteria for bright lively mediterannean flavors. We appreciate your review, Rachel! If you are looking for more information on the product that you have purchased, please contact our Customer Solutions team. I love this herb blend. I use it about twice a week on some of homemade sauces. I also use it occasionally on meats. I will recommend. I used this mix to add to roasts, Pork, Beef, & Chicken. it makes it taste earthy, and adding very good flavor to my dish. Regal Herb Blend is excellent for sweet and savory dishes. This herb blend works well with pasta and soups. I will continue to use this herb as a part of my cooking, and preparing selection. An excellent blend just the right mix to bring out that med flavor in all foods whether it is beef chicken or vegetables great product. Regal Mediterranean Herb Blend is an interesting blend that works well with Mediterranean dishes (like Greek Shrimp), in pasta sauces or sprinkled in the pasta, and also as an enhancement to salad dressings. Okay, this is my favorite of all my spices. This is beyond excellent on pasta, to the point of just shaking it on some cooked pasta and having a meal. Of course, I don't recommend that, but it's that good. If you don't want to spend a lot on spices, or know what goes with what, this is the ONE you need. It would also be great to mix in bread dough, or just sprinkle on top, some buttered toast, just about anything. Good stuff. We use this a lot, it goes in just about any pasta. I also put out some in a small shaker when I serve pizza and tell the guests it is our "secret house blend" - ha! Everybody has enjoyed this. This blend has been in nearly everything I've made since I got it. It's perfect for Italian food and I make a lot of pasta. Great spice mix. Not only do I use it to cook with but I use it to marinate beef or chicken and make salad dressing with. It has a good Greekish flavor to it. We love this spice blend. We have used it in pastas, on grilled chicken and even on roasted potatoes. It has such a great flavor without being overpowering. Definitely a must have! This is a great blend of spices with not too much salt added. I use this in bread and pizza dough and it gives off a wonderful aroma and taste even better. Mix it in with pizza dough or just add on top, either way its great. 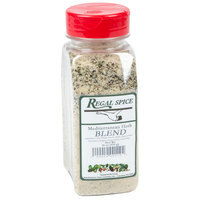 I love this blend, since it has great herbs and also salt is included. My new favorite is oven roasted petite yellow potatoes with olive oil and this herb blend. Also goes great with grilled or pan seared chicken breast! This is a very convenient spice blend to add amazing taste to dishes such as pasta. In most cases, all you need is this one spice blend. A good buy for sure! Making food and adding this mediterranean herb blend makes the food taste extra good. This is a cheap product that is a must buy and great addition to the restaurant. It is definitely cheaper to buy it here than elsewhere. The ingredients here are what i usually used in my kitchen, after buying this, its so much easier be because i don't have to individually pour seasonings out. great spice blend, reminiscent of filipino adobo, but different. Fresh and cleanly packaged. Convenience of 1 pound shaker bottle is awesome. Love the variety of blends available with web restaurant!